Mi Tierra is located in Springfield, MA. Mi Tierra is committed to bringing you quality corn tortillas in the proper way: with simple ingredients and simple cooking. Mi Tierra started as a family-owned Mexican restaurant, beloved by locals and visitors to the Pioneer Valley in western Massachusetts. One of our local organic farmers, Michael Docter, began working with Jorge Sosa and Dora Saravia, Mi Tierra’s founders and owners, to get them local corn for the restaurant’s fresh tortillas and chips. In October of 2013, a fire tragically burned down the restaurant, destroying everything that Jorge and Dora had built together over the previous ten years - but Jorge and Dora refused to give up. A group of local foodies, activists, farmers, and restaurateurs rallied together to help them rebuild Mi Tierra! Jorge and Dora set up a small space on Michael Docter's Winter Moon Farm to produce their famous corn tortillas and chips. When Michael Docter came to our warehouse to bring us his latest harvest of parsnips and radishes, he brought along a few bags of Mi Tierra’s magical tortillas. As soon as Mi Tierra received organic certification, we began offering their tortillas to our customers as add-ons. 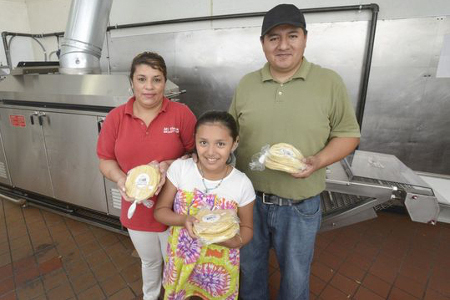 Not only are their freshly-made tortillas incredibly delicious, but every organic tortilla you buy from Mi Tierra also helps Jorge and Dora raise money to rebuild their family's restaurant. You can read more about Mi Tierra's story in this article by the Boston Globe. You can also donate directly to the cause through the Mi Tierra website!